October 2, 2011 by Venky. It was one hell of a ride to close a fantastic week of riding. 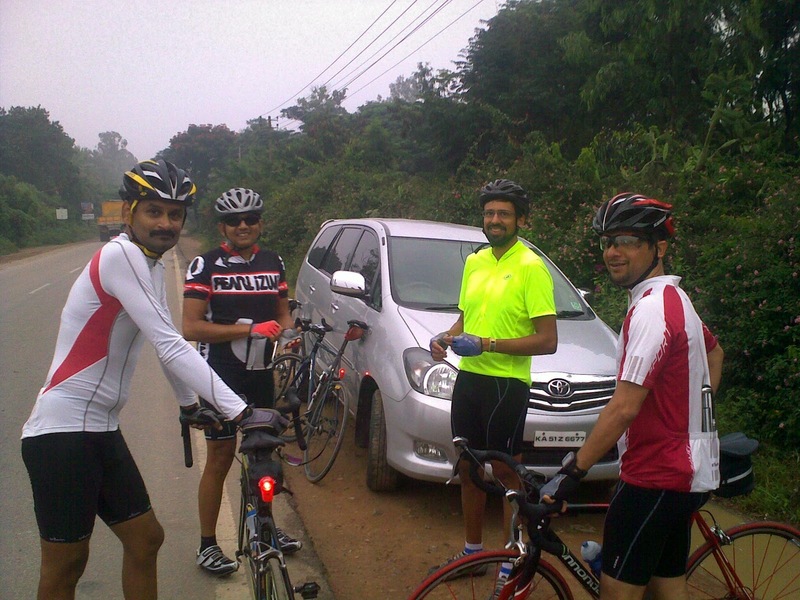 Siva, Deepak, Minkey and Ameet at the start of the ride on Siva’s road! The day started with a panic that I might miss the ride altogether. Woke up to a slow leak puncture on the Bulldog’s rear tire. Didn’t want to waste time trying to find the puncture and decided to get rid of the old tire and replaced it with a spare I had. Removed the wheel, changed the tire and tube in flat 15 mins and the bike was ready. Sent out a message to the guys that I’d be slightly delayed and they decided to wait up for me. Had to do a time trial of sorts to get there at 32 kmph for 9km. Then, Deepak, Ameet, Siva, Gautam and I started riding together. Within no time Ameet and Deepak set a strong pace and marched ahead. Gautam, Siva and I started riding together at a decent clip. After Budigere Siva started to feel his muscles and slowed down on the inclines. We reached the end of Siva’s road and turned back. Gautam and Siva decided to stop over at Budigere for idli. I rode back with them for around 7km turned back to join Major and Balu who were on their way to Nandi. Balu was off the saddle for a while and has not been riding regularly. So he was struggling on the inclines and Major and I tried to keep pulling him. We got on to Nandi approach road and I tried to shield Balu from the headwinds and tried to pull him. We slowed down a bit in the process. In the meantime Deepak and Ameet reached Nandi base and completed their breakfast too. Deepak called to know where I was and I asked them to start on their way back having decided to turn back with them. I wished Major and Balu a good ride and started riding with Deepak and Ameet. Saying that started riding _with_ them is not quite accurate. They just took off on a downhill and built a gap of around 300mts or so immediately. I started to give chase and began to give it all to bridge that gap. It was not working although I managed to keep them in sight and not let that gap increase. I took more than half an hour of chase at 32 kmph to bridge that gap once we got on to Siva’s road. It was a painful chase. I wondered what those two had for breakfast at Nandi base! They were blazing fast. But I really enjoyed the hard workout that I got chasing them.